The strong 13.9 per cent growth in turnover to hit EUR 1,026.8 million was partially influenced by the positive development of the price of copper. As the actual price of a cable is calculated daily based on the current price of copper, turnover also increased due to the higher copper prices. The increase in turnover that can be attributed to copper is around 5 per cent. Currency rates only had a minor influence on turnover, with a reduction of 0.3 per cent. When adjusted to take account of the aforementioned variables, turnover increased by around 9 per cent, which was considerably stronger than the prevailing market climate. “This increase can be traced back to our successful strategic initiatives in particular: we have developed attractive new product ranges and optimized the work of our Sales Department. These facts aside, important sales markets such as mechanical engineering and systems engineering continued to grow steadily,” asserts Member of the Board Finance and Controlling Dr Ralf Zander. 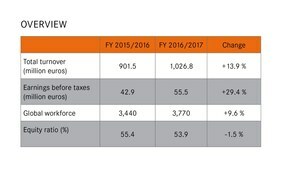 Earnings before interest, taxes, depreciation and amortization (EBITDA) amounted to EUR 81 million (compared to EUR 66.8 million the previous year). Growth of 21.2 per cent means that this result increased disproportionately to the company’s growth. Earnings before taxes (EBT) increased by 29.4 per cent over the previous year to reach EUR 55.5 million. 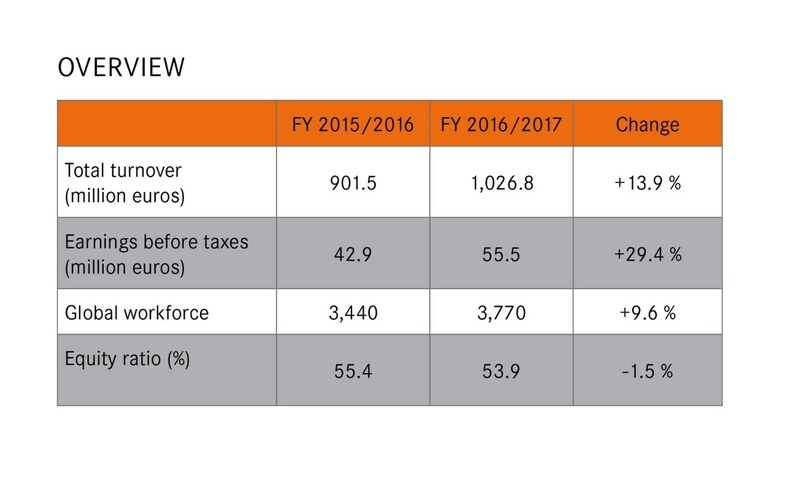 Although the equity ratio decreased slightly to 53.9 per cent due to the increased balance sheet total (previous year: 55.4 per cent), it continues to be very high. EUR 24.1 million were invested in the financial year 2016/2017 – around EUR 4 million more than in the previous year. Focal points for this were the continued roll-out of the SAP software ECC 6.0 and investment in Lapp’s new European headquarters in Stuttgart. This aside, investment flowed into machinery, plants and logistics in the various production and distribution companies. Digital transformation is one of the most important topics of the future, and that goes for Lapp as well. Lapp has established a dedicated team to deal with all aspects of digitalization within the company. In all divisions, projects are currently ongoing to address topics such as opening up new market opportunities with digital technologies, automating processes and optimizing IT infrastructure. The trend towards networking in industry will also bring significant opportunities for the Lapp Group. “Connection solutions for industrial data communication are the backbone of Industry 4.0 or the Industrial Internet of Things (IIOT). These have been – and continue to be – a focal point for the Lapp Group’s innovations,” explains Georg Stawowy, Member of the Board Technology and Innovation. One example is the ETHERLINE® TORSION Cat. 7: the first torsion-resistant and PROFINET®-compliant Cat. 7 cable. The high-speed cable for industrial Ethernet can transfer data at rates of up to 10 Gbit in a frequency band of up to 600 MHz. This is relevant for applications in the machinery and robotics segments, where large volumes of data from the likes of sensors or high-resolution cameras are commonplace – a key requirement for Industry 4.0. Since 2017, Lapp has also been offering active network components for industrial Ethernet systems for the first time in the form of ETHERLINE® ACCESS products. Lapp took this step based on the fact that only the combination of an industrial-grade switch and industrial cables is enough to deliver the very highest performance in terms of transmission quality and reliability. This is also the reason why users prefer to procure complete systems for industrial applications from a single source. The Lapp Group notched up particularly strong growth (of 27 per cent) with the connection solutions for industrial data communication supplied under the ETHERLINE®, UNITRONIC®, HITRONIC® and EPIC® DATA brands. “This success shows that our customers are rewarding our efforts. The Lapp Group will continue to position itself as a preferred partner for the physical layer of industrial data communication in the future as well,” Georg Stawowy emphasizes. A growth rate of 17 per cent – considerably above average – was also achieved by the pre-assembled ÖLFLEX® CONNECT cable systems. The initiative of offering special connection solutions for rail vehicles also continued to pay off; talks and trial processes held with European manufacturers were very promising. The modular EPIC® MH rectangular connector system is another important innovation. This solution enables users to perform configuration themselves, thereby incorporating various functions into one single connector. This flexibility is provided by a plug-in frame that can be equipped with Lapp connector modules and market-standard modules alike. Perched atop a mountain in Namibia, the H.E.S.S. telescope searches for dying stars in the farthest reaches of space. These emit gamma radiation, which can be detected for a few billionths of a second in the form of blue light. Lapp supplied special twelve-core HITRONIC® glass fiber cables for an upgrade to the facility, which comprises five individual telescopes with diameters of between 13 and 28 meters. These cables are able to move in unison with the telescopes, which are constantly realigned to point towards new regions of space. This upgrade guarantees fast and reliable transmission of the camera data to the computers in the control center at all times. The Bystronic glass Group, which is based in the Northern Black Forest in Germany, produces machinery and plants for manufacturing insulating glass. To name just a few examples, insulating glass made using Bystronic machines can be found installed in the Oscar Niemeyer Tower in Rio de Janeiro, the Mercedes-Benz Arena in Berlin, the Shanghai Tower or the Burj Khalifa in Dubai – the tallest building in the world. Bystronic glass was able to significantly accelerate their production process thanks to completely pre-assembled ÖLFLEX® CONNECT power chains from Lapp. This fact allowed Bystronic glass employees to concentrate more fully on their primary task instead of spending time assembling power chains. At the end of December, a ground-breaking power-generation facility combining wind turbines with pumped-storage technology went online in the community of Gaildorf, Southern Germany. With this so-called “water battery”, construction company Max Bögl Wind is setting new standards for the energy revolution. The Lapp Group supplied cables for the facility – from the tower to the cables for direct burial. What’s more, the tallest of the four wind turbines is also the tallest in the world at a height of 246.5 meters. The Lapp Group has added personnel reinforcements to its ranks with additional recruits in almost all divisions. The number of employees worldwide rose from 3,440 to around 3,770. This equates to an increase of 9.6 per cent over the previous year. “These many new employees need to be integrated and receive further training together with all existing staff members. After all, our goal is to be ‘best people in business’,” explains Dr Hilmar Döring, Member of the Board Human Resources and Organizational Development. That is why the HR Department’s focus for the previous financial year was on the continued professionalization of staff development. We have developed a global skills model in support of this, to name just one example. Among other areas, this is implemented in the context of succession planning, further training and talent promotion. The Lapp Group anticipates continued growth in all regions for the financial year 2017/2018 as well. Lapp expects a significant boost from the continuously increasing demand for industrial data transmission systems, among other factors. In addition, Finnish companies SKS Automaatio and SKS Connecto were acquired at the turn of the year. With SKS Automaatio – as a leading company for automation and cable assembly – the Lapp Group is reinforcing its position in these areas, which have vital parts to play in Lapp’s Strategy 2020. Furthermore, the new company Lapp Australia was founded in early February as a joint venture with ECS, our long-time partner from New Zealand. Lapp wants to continue to cultivate the Australian market with this new joint venture.